If you’re looking to spruce up your home, the dining room is a great place to start. It’s also a pretty cool place to experiment with bold and bright colours as the focal point tends to be the long table and they’re usually free from a vast amount of clutter. We generally think that red is the best colour to paint anything, so we’ve rounded up a list of some of our favourite red dining room designs on the interwebs. 1. This stunning white room is given a splash of colour with the bright red chairs, it’s almost a big nautical looking. 2. This cosy cottage style dining room makes great use of an apple-themed colour palette. Using off-whites, a bright red and a lovely lime green alongside the pale blue table really comes together quite well. 3. Are you sensing a theme yet? 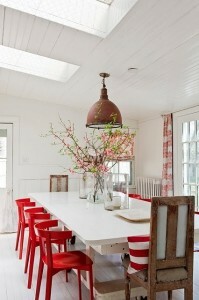 It appears that all of the dining rooms so far have paired red and white. There’s something very crisp and modern about red and white as a design feature, that must be why Guzzini chose it! 4. This red and white dining room fuses a contemporary look with classic accessories such as the china plates, the wicker chairs and the large distressed wooden table. So, whether you’re painting just one wall for a feature or the entire room, red is definitely a great colour for adding a contemporary and cool-looking accent to your dining room.